WE makes doing good, doable. And we’re proud to be doing it differently. WE Charity is not an old-fashioned non-profit. Our unique model lets us operate differently—you won’t find us soliciting donations through expensive advertising campaigns, TV commercials or paid canvassers. We embrace innovation, tackle the root causes of problems and operate with a low administration rate to ensure efficiency. To scale our impact and to stay sustainable, WE pulls best practices from the toolboxes of charity, business, and social enterprise. Our cutting-edge model makes WE a bit more complicated, but it also makes us stronger and more sustainable, allowing us to make greater impact. Like many non-profits, WE started out as a purely volunteer organization. In our earliest years, we focused on how to create the greatest impact through our development projects. Now we recognize, too, the responsibility we have to create positive impact in the lives of our dedicated staff and their families—because our people are the key to creating long-term impact around the world. At every step of our journey, we are deeply grateful to our employees, understanding that their contributions of skill, dedication and innovation are what make our mission and our growth as an organization possible. For them, we are committed to keep learning how to be better; to seek out new ideas; to empower even more youth and adults to create the change they want to see in their communities and around the world; and to create even more impact through our projects. We have learned that, in order to grow and scale, just like any other organization or company, a non-profit has to invest in its people and its infrastructure. Those investments truly do reap the right kind of returns: We are proud to foster diversity among our workforce, with women holding 77 percent of our leadership positions. And in anonymous surveys, 90 percent of staff say they are connected to our organization’s mission and 96 percent believe we are making a difference in the world. We know we still have work to do and that we may never fully reach the goals we have set for ourselves; that comes with the territory for any organization that strives, as we do, to be world-class. 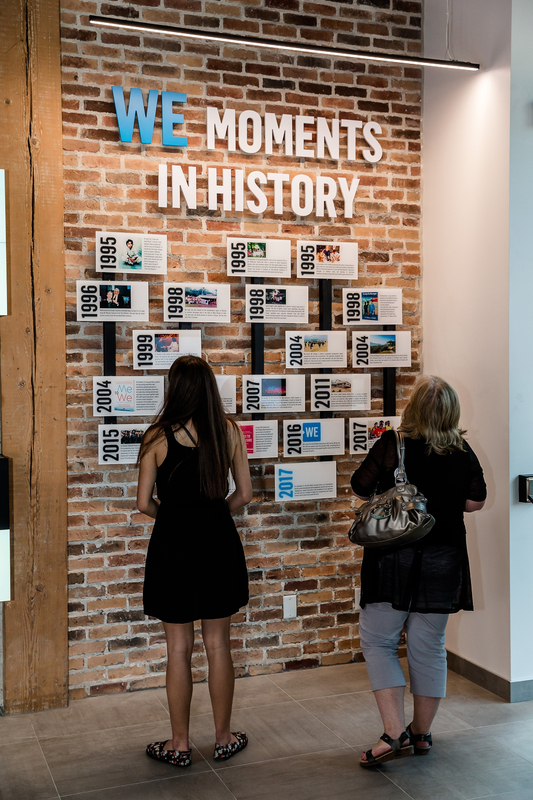 We’re sharing the story of our journey as people managers as a case study for other social purpose organizations, with the hope that our past stumbles and our efforts always to learn from them will help to guide them on their own journeys. WE Charity operates more like a tech start-up than a traditional charity. 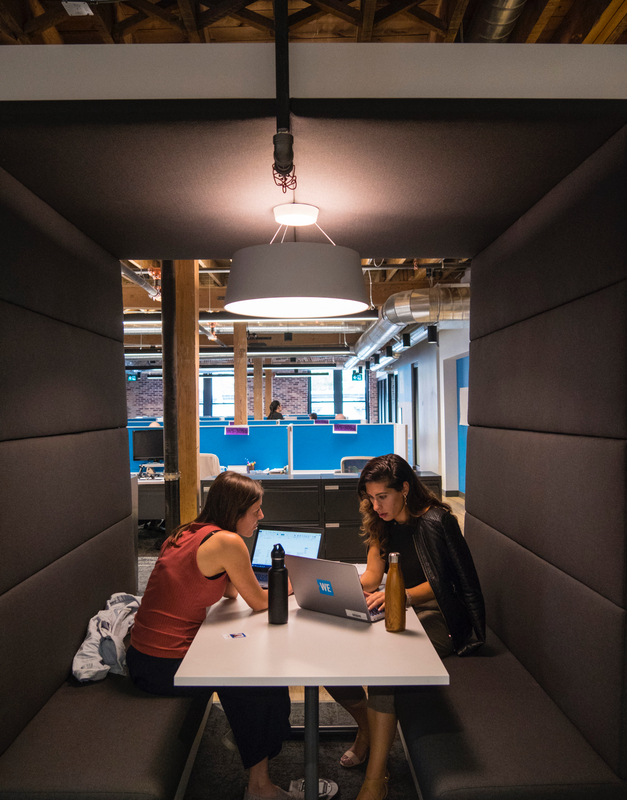 It’s not just the office snacks, (donated) fitness centre memberships, and dog-friendly policy that have people drawing comparisons to Silicon Valley North. WE breaks down our model when it proves ineffective, adapting and growing with mottos borrowed from the tech sector: “fail fast” and “always be innovating.” Instead of iterating on the best software, we’re refining the best methods for world change. Two decades ago, WE Charity started raiding factories to rescue child labourers. But families were so poor that rescued children were immediately sold back into slavery. To address poverty as a root cause, our WE Villages sustainable development model was honed over 20 years. WE built it, tested it, broke it and rebuilt it countless times. Now, one million beneficiaries in partner communities around the world are empowered to forever lift themselves out of poverty. In Silicon Valley North, they call this trial and error “agile development.” In the charity sector…well, they don’t really have a term for it. Too many charities operate their same old model because they lack the resources to take risks and innovate for improvement (more on what keeps us sustainable and agile below). Failing fast means WE doesn’t always get it right—in fact, that’s directly implied. But our dedicated staff drives us forward, and they join the organization because of a commitment to constant improvement and creating massive impact. 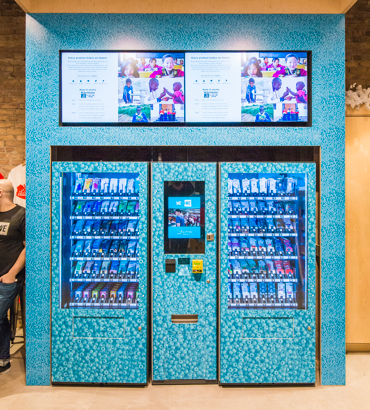 WE hire for culture fit first—because we admit that this type of innovation and speed isn’t typical of most charities. Our rapid pace, similar to a tech start-up, or consulting and investment firm, creates a unique charitable culture that’s not a fit for everyone, especially those coming from traditional non-profit or government roles. We’re not saying that every charity needs to function in the same way, but our work environment welcomes individuals with a passionate drive to better the world. We’re grateful to have been awarded three times as a Top Employer for Young People and having been twice named as one of Canada’s Top 10 Most Admired Corporate Cultures. 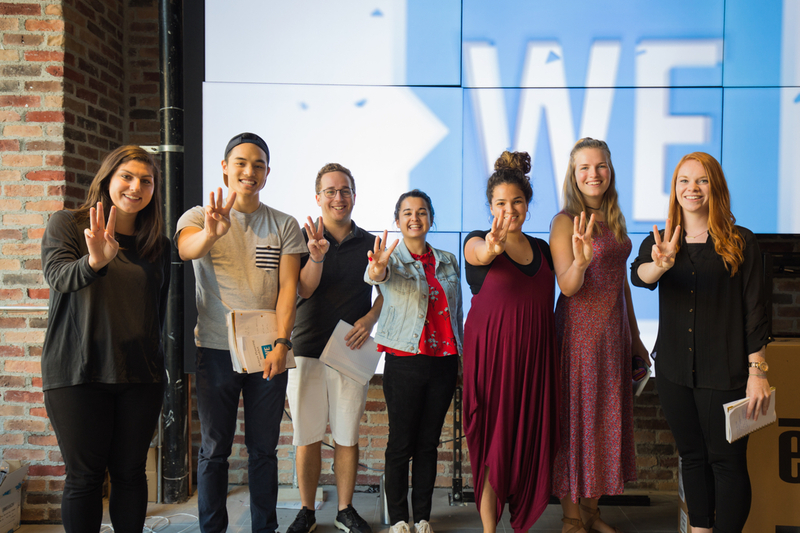 But we’re most proud of the fact that via a 2018 anonymous survey of WE employees, 80 per cent see a future for themselves with WE, and 98 per cent believe they are making a positive change in the world because of their work. As an equal opportunity employer, we’re also proud of the fact that 77 per cent of our leadership of department heads and directors are women. Ask our staff who their heroes are. You might hear Mother Theresa or Nelson Mandela. They’re just as likely to mention Paul Polman or Sheryl Sandberg. WE forms partnerships with governments, foundations, educational institutions, and some of the world’s biggest businesses (and business moguls). WE believes in the UN Sustainable Development Goal #17: that companies must create a more just and sustainable world. Through our rigorous partnership vetting process, we identify like-minded companies to provide the in-kind support, skilled volunteerism, technology enablement, and resource investments to exponentially scale our impact. We tap into the core competencies and business intelligence of our partners to help achieve efficiencies, off-set costs, and impact more lives. 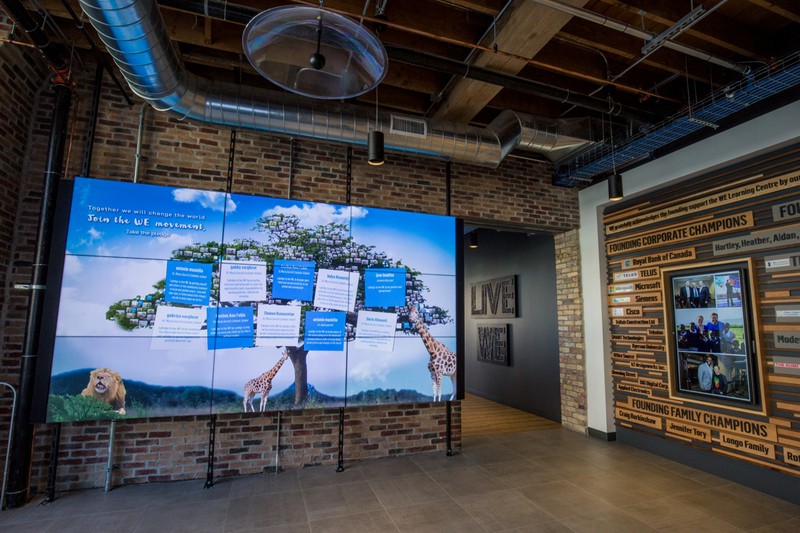 For example, Microsoft assisted with a digital transformation program to geo-track the delivery of our global impacts, such as life-saving inoculations, school supplies, and other program benefits. Corporate partners provide access to potential donors and volunteers. While most charities recruit supporters through mass advertising or by purchasing mailing lists, our corporate partners introduce our programs to their network of consumers and staff. 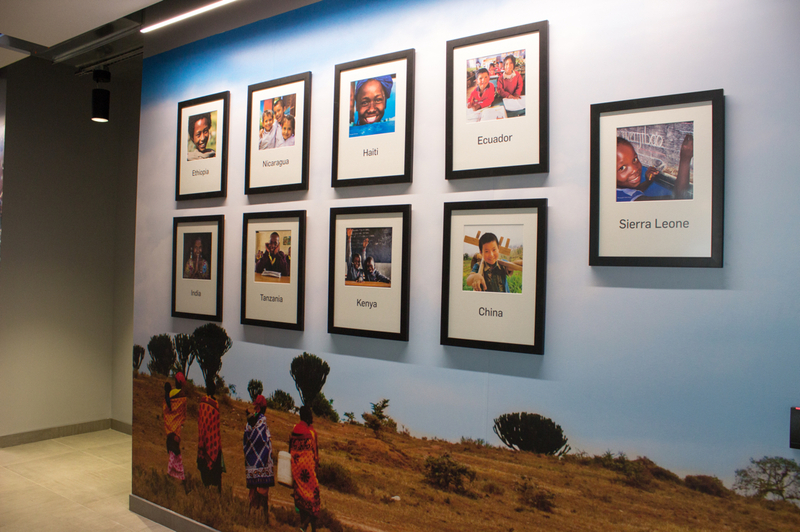 For example, Walgreens Boots Alliance provides free signage in their 10,000+ stores to encourage their millions of annual customers to support the global development work of WE Villages. Our in-kind and pro bono partnerships drive down our operating costs. TELUS absorbs our telecommunications costs. DHL provides free shipping. We believe that every dollar saved in expenses is a dollar earned to impact more lives. Through the support of our partners, we are proud that our domestic programs are available free of charge to youth and families. In the U.S., an average of 63 per cent of students engaged in WE Schools are from Title I eligible (free or reduced lunch) schools. We believe that world-class service learning and educational resources are not a privilege of the few but should be available to all young people who are excited to make a difference. For more info on why we partner with companies, click here. Of course, WE doesn’t just partner with companies. WE also partners with individuals, education groups, and lots of other non-profits to create positive social change around the world. 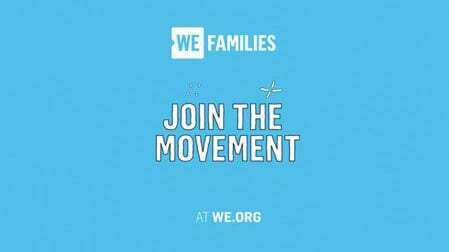 Our WE Schools program will support young people with free resources to volunteer and fundraise for any cause —even if that isn’t us. Don’t worry, there’s no hard feelings; if youth want to support another cause, our team will help! There are too many duplicated efforts and too much competition in the charity sector. As a core value, WE believes, “WE are Stronger Together”. Remember when WE promised not to bombard you with paid TV ads soliciting donations, where a large percent raised goes to pay for more costly TV ads? 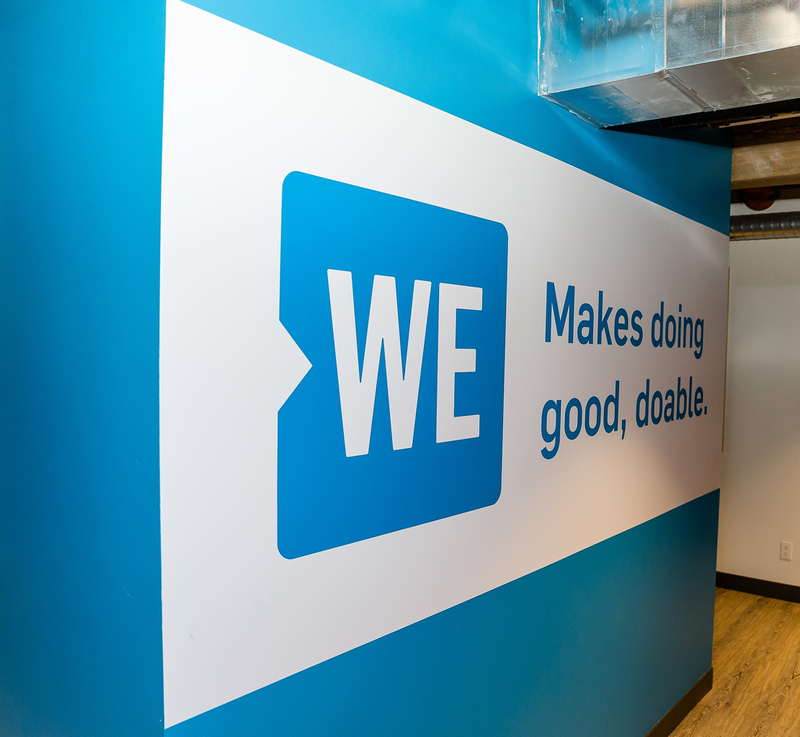 ME to WE, our social enterprise, makes that promise possible. WE Charity doesn’t pay for street canvassers, fundraising galas or other practices common to traditional charities. Those methods are costly, often forking over a good portion of donations to pay for fundraising. 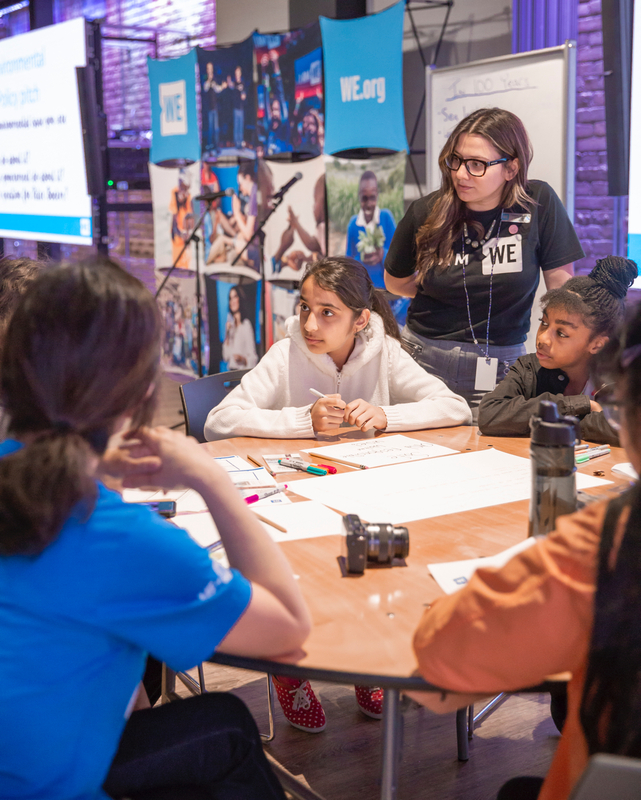 In addition to working with so many amazing young people, educators and partners, we created a unique and innovative approach to furthering our social mission – we launched a social enterprise! 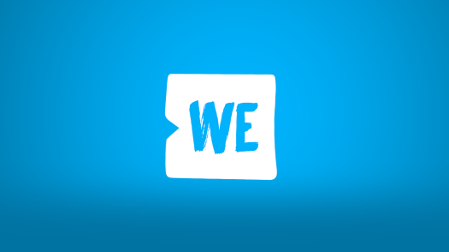 ME to WE Social Enterprise supports WE Charity financially, and by addressing the root causes of poverty through encouraging consumer choices that make an impact. For example, ME to WE’s Fairtrade chocolate brings better income to farmers in Ecuador, boosting the local economy by creating employment. And, a portion of every bar sold goes directly back to our WE Villages projects in the very same communities where the farmers live. It’s called a closed-loop system, and it doubles the impact, solving the root of the problem on multiple fronts. 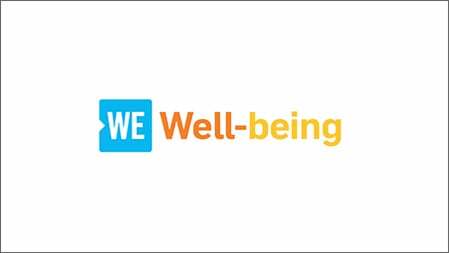 ME to WE’s provides a minimum 50 per cent of profits directly to charity efforts. The balance is re-invested to grow the social mission, such as, for example, launching the next Fairtrade line of products. In practice, the social enterprise typically donates closer to 80 per cent of profits to WE Charity. In case you’re wondering why this doesn’t happen more often—it’s very common in Europe, although not as established in North America. ME to WE blazed a trail over ten years ago in Canada, navigating complicated legal structures and regulations. We won’t bore you with bureaucracy and governance, but a retired Supreme Court Justice was called in to help, as well as two of Canada’s top law firms (pro bono), and a former Canadian Prime Minister. A governance structure was approved by the Ontario Public Guardian Trustee and continues today with strong oversight and reporting to the WE Charity Board of Directors. With ME to WE propping up the administrative costs for WE Charity, we can continue to take risks, innovate and grow. Thanks to ME to WE’s annual donations and other efficiencies, WE Charity achieves an administration rate of less than 10 per cent – resulting in over 90 per cent, on average, of every dollar donated allocated directly to youth-serving programs. In the past couple years alone, we grew our programs to 16,000 schools, hosted 40-odd WE Day events in cities around the world, opened a Global Learning Center with technology for distant education, developed AP with WE Service as a system-level change for U.S. education, launched a new College in Kenya and much more. Any single one of these things could be the paramount accomplishment of an old-school charity. But WE isn’t done yet. Our next project is The WE Social Entrepreneurship Center. Together with other high-impact charities and global social enterprise leaders, we’ll foster greater impact in the non-profit sector by sharing our learnings about innovation, partnership, social enterprise, and other factors that have assisted in our growth. The hub will offer training, mentorship and resources to budding young social entrepreneurs and established non-profits alike. We’re grateful for all of the incredible support that we’ve received to innovate within the charitable sector, and we want to assist others on their innovation journey. 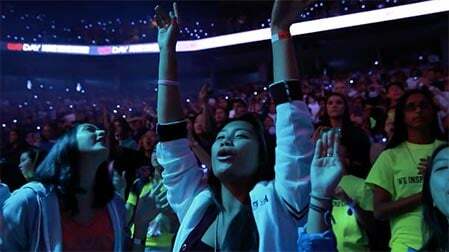 Scale: WE reaches 4 million youth involved in service around the world. Impact: Between 2012 and 2022, we set our goal to create the equivalent of U.S. $3 billion in social value. We measure this by volunteer hours* committed and funds raised by the WE community, which collectively benefit our programs and more than 2,500 charities.